I walked through almost every aid station. I usually took two cups of water. One to drink, one to pour down the front or back of my shirt. I stopped twice to pee. In other words, I stayed hydrated. I didn't, however, wait in the port-a-potty lines. If you want to know my quick, discreet method for potty stops, let me know. I carried my hand-held filled with Powerade. I can't stomach yellow Gatorade, which is what they have on the St. George course. I also took two electrolyte tablets about every six miles. I ate a banana about an hour before the start. I didn't GU or put anything other than liquid in my body during the race. My body was very grateful. I took a sinus tablet and my anti-nausea medicine when I ate my banana before the race. Both did their jobs. I wore my new Active Bands headband. I'm thinking they might be good luck charms. Just sayin'. This is the second race where my watch has malfunctioned (in this case it was a user malfunction) and I have gotten a surprising PR. I really think there is something to listening to my body rather than constantly watching my pace and time on my watch! I listened to music the entire race (other than the last 1/4 mile). And I ran the entire thing alone. I seem to do better when I run alone because I'm not trying to make conversation and I don't pressure myself to go at someone else's pace. I love seeing people I know before and after races though!! So much really is mental. I didn't believe that before this race proved it. And now looking back, I can see how much my attitude affected past races. I went into this knowing I had trained and was physically prepared. I was excited and had a plan if it was really hot again. 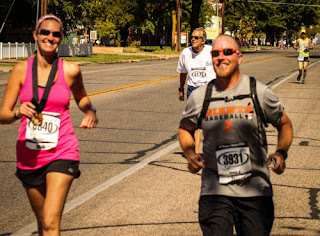 I psyched myself up all week before the race. I made an extra effort during the race to focus on my music or think about something else when I started hurting. I told you in my last post, I couldn't stop smiling. Even when I was getting a little stiff and went back to run the hubs in, I was smiling!! Then I got the proofs for my race photos yesterday. 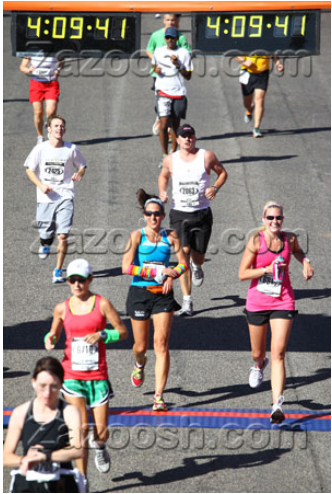 Apparently the smiling began when I crossed the starting line. I am smiling in every. single. one. These are just two of 11 smiley photos. 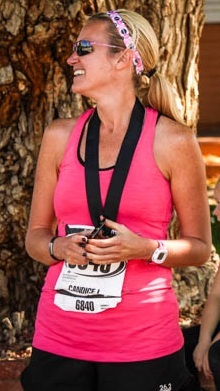 And if I was smiling this big when I crossed the finish, knowing my chip/actual time was even faster, you can just imagine my smile when I saw that it was really 4:02:44!! Nice pics. I'm running a half this weekend and I'll have to remember to smile for the camera. It makes for such good photos. Plus I had my teeth cleaned this week (coincidence not on purpose) so my teeth will even look good. 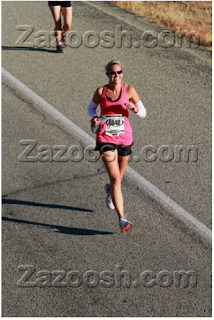 I am so jealous of all your race pictures. Sounds like it was an amazing day of racing. Congrats!!! Congratulations! 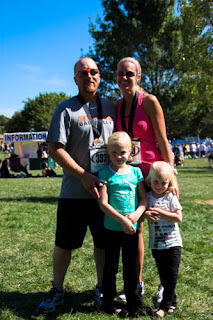 I love happy race pictures because you know the person just plain loved the run! Awesome! Looks like you had so much fun. Great Job! You did so well, congrats again! It is all mental...I like and know that. I also do better alone. I never look at my watch while running and gauge all via my body. The photos are great! Have a super weekend! Sounds like a glorious race. 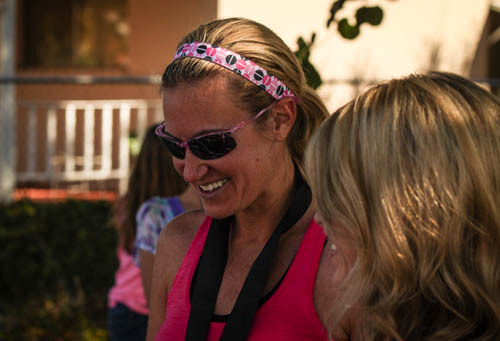 Like Rachelle said, races like these are what make all those training miles worth it. I bet you wish you could freeze that race in time and run it over and over again. Fantastic job! 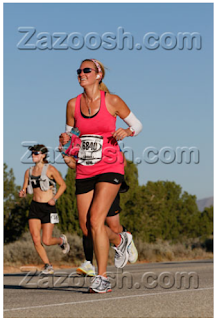 I'm always in jaw-dropping awe of full marathoners!! Congrats! Those are great smiling pictures! It really must have been a PR day. Plus your legs look so great!